Eliminate costly downtime with the Telar material alarm. 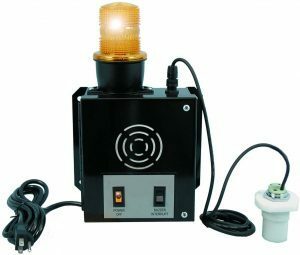 Featuring a loud 90db buzzer and a bright amber strobe light to notify a machine operator. The material alarm will detect low levels of material in a hopper and can also be used as a high level detector in a catch bin. This easy to use material sensing alarm comes complete with a metal case with mounting bracket and a proximity sensor with a 10 ft. cord and a sensor mounting adapter is included. Included with every material alarm is the sensor mounting adapter. Made from Delrin, this adapter can be bolted directly to your hopper. The adapter has 1 1/4″ pipe threads that can also thread into a welded coupling. Since the material sensor can sense low level and high level material conditions through the closed end you can easily remove the sensor from the adapter even when the hopper is loaded.